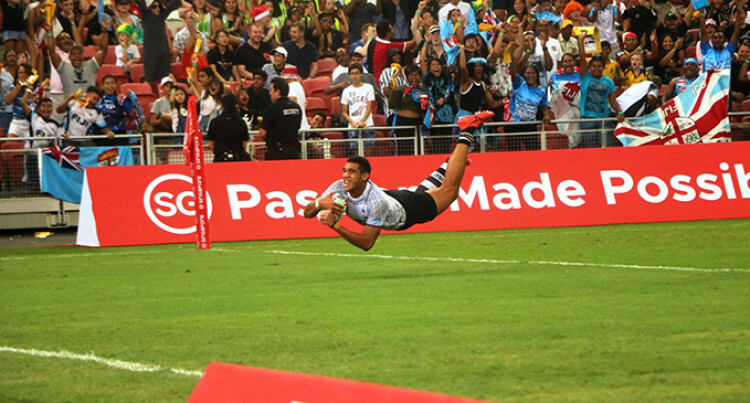 Fiji Airways Fijian 7s coach Gareth Baber believes self-belief and national pride helped them beat England 24-12 in a thrilling Singapore 7s Cup semi-final last night. Two tries to forward Josua Vaku­runabili and one each to Sevuloni Mocenacagi and Meli Derenalagi led the defending champions to a determined victory and spot in the Cup final. The Fijians lost star half-back Jer­ry Tuwai to a suspected hamstring injury in their opener against Can­ada and there were doubts about the team’s ability to cope without him. But Baber, in his post-match in­terview, said the players matched the standards set by Tuwai and stepped up at a critical time for the team. “(The win) is a testament to peo­ple like Jerry Tuwai who stayed the course and showed to the play­ers exactly what the model is for being a pro player,” the Welshman said. Fiji scored as early as the first minute after strong running by Mocenacagi drew the attention of three defenders, creating space for Vakurunabili to cross over in the right hand corner. Livai Ikanikoda, playing at half-back, missed the conversion as Fiji led 5-0. Vakurunabili crossed the line two minutes later for his fourth try of the tournament after again com­bining brilliantly with Mocena­cagi, with Ikanikoda converting to extend Fiji’s lead to 12-0. England speedster Dan Norton posed the biggest danger to the Fi­jians but was marshalled well by winger Aminiasi Tuimaba as the scores remained 12-0 at half-time. Captain Paula Dranisinukula was sent to the bin just seconds into the second half when he tackled an England player in the air. The English then captialised with the extra man through Harry Glover who crossed over in the left hand corner despite good defend­ing from Tuimaba. Fiji led 12-5. Dranisinukula nearly made amends for his yellow card when he crossed the line three minutes in with a charge to the line but the TMO ruled a knock-on. England responded a minute later through Ryan Olowofela after a couple of missed tackles by the Fi­jians to level the scores at 12-12. It all began looking a little for Fiji when Tuimaba was yellow carded for a deliberate knock-on late into the match, but England kept at bay by a determined Fijian defence. Mocenacagi then beat two play­ers to complete a lightning-quick counter to score the winning try with Napolioni Ratu converting to make it 19-12. Derenalagi then sealed the deal with an intercept try in the final play of the game to send the Fiji­ans into their second successive Singapore 7s final. Paula Dranisinukula- Passed his first big test after veteran Jerry Tuwai got injured, lost two pool matches but managed to inspire this young side to reach the Cup final.